For the past month Julian and Sebastian have been trying to work out what Julian wanted for breakfast on his birthday. Clearly they really are my children. There was talk about breakfast sandwiches, although that idea was really from Sebastian as Julian takes them apart and complains. They also mentioned french toast and chocolate croissants. Then 3 days before his birthday I made Liege Sugar Waffles and the boys began lobbying to have them for breakfast on Julian's birthday. The recipe calls for Lars Belgium Pearl Sugar but I substituted Lars Swedish Pearl Sugar because I had a package of it gathering dust in my cupboard for over 4 years now. Both sugars will not melt in the heat of the oven (or waffle iron). 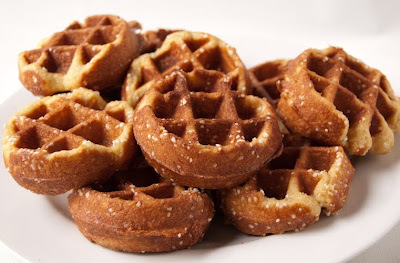 The Belgium sugar is larger so the sugar will create pockets of crunchy, caramel sweetness in the waffle. With the Swedish sugar the sweet pockets were smaller and gave more of an overall sweet caramelized flavor to the waffle. That flavor combined with the almost deep fried texture and richness from the cup of butter in the batter was irresistible. So much so that my photo shoot the first time I made the waffles got interrupted by a thieving boy. They were so good, we forgot to save any for Lewis. Okay we remembered, but only after we had eaten all of them. I made them with Swedish Sugar again this morning as the Belgium Sugar is not available locally. I will look for it the next time we are in New York City. I am sure both will be delicious. To make them for Julian's birthday I mixed up the dough the night before and let it rise slowly in the fridge overnight. This morning we took it out of the fridge and set the bowl in a bowl of warm water to bring it back to room temperature. It worked perfectly and then we delivered our children in their sugar comas to school. To celebrate Julian's 5th birthday let me share this photo from when he was 2. This photo was taken on vacation in Cape Cod. The extension cord is one he claimed for himself that he found under the bed at the cottage we were staying at. It was his comfort object that week. Some children love dolls, some children love trains or cars, for Julian it has always been electricity. After he fell asleep we would tip toe back into his room and wind up the cord so he would not strangle himself in his sleep. Not letting him have the cord was never a possibility. Instead, as good parents, we bend out prongs and ask people from other countries to send us surge protecters and power cords. At 5 he is still strong willed and still loves cords and wires, and I am just proud that he is still alive. Good luck to his Kindergarten teacher next year, I hope she can keep up with him. Mix the yeast, water and granulated sugar in a small bowl and let it stand at room temperature until really foamy. This took about 5-7 minutes when I made them. Mix the flour and salt together in the bowl of your stand mixer and make a well in the center of the flour/salt mixture. Pour proofed yeast into the well and mix with the flat beater blade on medium speed, adding the eggs one at a time. After each egg is well incorporated add the next one. Drizzle the melted butter in slowly while the mixer is still running to give the batter a chance to absorb it. Once the butter is fully incorporated add the vanilla and mix well. The batter should be thick and very sticky when you are done. Remove the bowl from the mixer and put the cover on it or cover with a plate. If you wish to eat them that day allow to rise at room temperature until the batter has doubled in bulk, about 1 hour. If you plan on eating them the next morning put the bowl in the fridge and take the bowl out of the fridge and place in a larger bowl of warm-hot water to allow to come to room temperature, stirring to allow all of the batter to warm up. Mix in the 1 cup of pearl sugar and allow to rest for 15 more minutes. 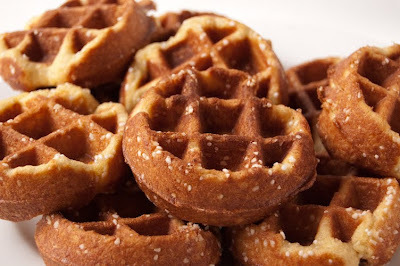 Preheat your waffle iron while the dough is resting. I used this waffle iron and thought they were the perfect size. Any waffle iron will work though although a belgium waffle iron would be best. For my waffle iron I used 2 Tbsp of batter per waffle. If you have a regular sized waffle iron experiment with what sized Liege waffles you prefer. Some recipes call for only using a 2 inch ball of dough in the center of the iron. These waffles are very rich and a full sized waffle might be too much. Do not grease the waffle iron before cooking, trust me these are self releasing. * If you do not want to buy the specialty sugar crush about 60 sugar cubes in a plastic bag using a rolling pin, saucepan or meat mallet. Sift the crushed sugar and measure 1 cup of the large pearl and chunk pieces. This sugar will melt in the waffle iron so the taste will not be exactly the same but there will still be pockets of sweetness. 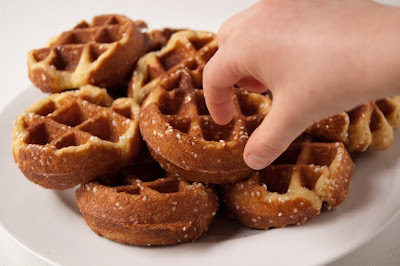 If you use crushed sugar cubes remember to clean the waffle iron right away while the sugar is still warm as the melted sugar will harden as it cools and be very hard to clean. Last week I took Sebastian to have 3 baby teeth removed to allow the 2 adult teeth that came in behind them like a row of shark teeth space to move forward. This is just the start of our orthodontic road, one that I should have envisioned when I fell in love with a Brit, that is if the stereotypes are to be believed. Although his crooked bottom teeth could also have been a tip off. Sebastian had a panoramic jaw x-ray that shows a future where space issues will not be so easy to solve. In preparation for the removal He was given a sedative and as it began to take effect I found myself with very mixed feelings. After all he was honestly hilarious saying things like, "Whoaaaa, this chair is floating. How do I stay on?" After his teeth were removed he asked for a mirror to see the new him. After staring at his new smile in a kind of removed glazed way he held the mirror up to the dentist light. When I asked him what he was doing he replied, "I'm letting the light see itself." When he was going through the prize box he put on one of these bracelets and said, "Mommy look, it's like a slinky." Then he floated his arm through the air saying, "Wheeeeeeeee." The problem I have is with it is, now, thanks to an oral surgeon, I have seen what my 7 year old would be like stoned. But in the end the whole morning was an opportunity to reconnect with Sebastian. As he gets older we are moving away from the relationship we had when he was a baby. He is still cuddly and affectionate, loving to hug and sometimes it seems wanting to be attached to me. But somehow it is still different, he is still 7 and independent, not needing me for all of his needs. Holding my hand to walk to school until a friend joins us and they want to run and climb trees When we left the office he was helpless and dependent again as I carried him to the car and drove him home. Like a toddler he sat in the back asking the same questions over and over. Apparently the sedative they gave him affects memory, this way he will not have a memory of them actually removing his teeth. In the car on the way home it meant he had no memory of my telling him, five minutes ago, that his teeth were already removed and we were going home, so he kept asking. I am appreciative that he is growing up and our relationship is changing, but I still enjoyed the morning together that captured the best parts of our relationship when he was a baby, with out the unending work. It was a little like I imagine being a grandparent will be. When it was time for him to eat something he ate an entire pint of home canned applesauce, and then he and I shared a stellar omelette. The omelette had cheddar, cilantro, smoked ham and avocado and had him rolling his eyes back with joy. Julian doesn't like omelettes so we don't have them as much as Sebastian would like. However I am not going to share an omelette recipe with you, instead I am going to share the banana cocoa pancake recipe we had the night before for dinner. The one Sebastian enjoyed enough that he happily ate dozens of them, which was helpful as he could not have breakfast before the procedure. I know I just shared a pancake recipe with you but in my opinion you can never have too many variations. Pancakes make a great quick dinner and in some houses are considered a special breakfast. Not to my spoiled children however, who think breakfast is not special if it took less then 30 minutes to make. If you want to make my two feel special you are expected to really work for it. This recipe is wholesome and different. It contains no sugar, relying instead on the super ripe banana for sweetness. The recipe contains both whole wheat flour (I upped the amount used when I made them) and wheat germ. 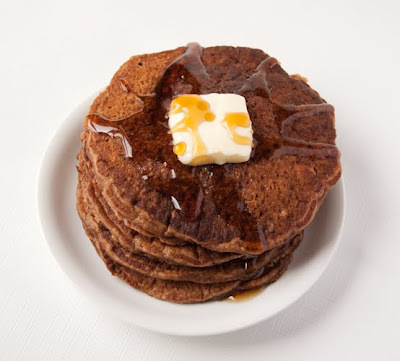 As is often the case for a flavor rich dish you cannot taste the whole wheat in the final pancakes. Combine the yogurt and banana in a large bowl and puree using an immersion blender until smooth (you can also puree in a blender or food processor). Add the milk, eggs, vanilla, salt and cocoa powder to the yogurt banana mixture and blend. Stir the baking soda, wheat germ and coconut if using into the wet mixture and stir well. Add the flour and mix until just combined. Add the melted butter and stir in until just incorporated. Cook pancakes on a lightly greased griddle, non stick pan or cast iron pan. Serve warm with butter and maple syrup or nutella and banana slices if desired. I have been thinking a lot lately about food and community. Lewis is reading A Papa Like Everyone Else by Sydney Taylor to the boys, and I am reading it to myself. In one chapter Mama and her daughters, Szerena and Gisella go to make their Passover matzoh at the synagogue. They bring the flour that was specially ground for the purpose and a basket to carry home the finished matzo in. In the synagogue they work with the other women of the community to make all the matzo they will need for the 8 days of Passover. The scene is one of shared talk and work, a joyful gathering. A modern Jewish family does not need to make their own matzo, they can just go to the store and buy as many boxes as they need. Somehow I cannot help feeling that we have lost something, not just a connection to our food, but also one to our neighbors. On my street we don't make matzo together or help tend the community cattle but we do share our food and lives more then I think is the norm. We have one neighbor whose kitchen is like an extended pantry for us. Many times when I am preparing dinner and I realize I am out of one of the required ingredients and I call across the street to check if my neighbors have any. When I call to ask if they have some cumin, vinegar, garlic, carrots etc to share they often have a similar request. Growing up in Manhattan we never asked a neighbor for a cup of sugar or a quarter cup of rice wine vinegar. We just went to the grocery store and bought that one missing ingredient. I prefer the method I have now, which is often accompanied with a brief conversation about our children and either the fiendish things they are up to or a funny story. My street is made up of small houses that are built almost on top of each other. In the summer this might be a problem for some of my neighbors as my boys keep up a constant chatter at them over the fence. Sunday I made Gingerbread Pancakes for breakfast and my boys shared the leftovers over the fence as barter. They gave our neighbor, Paul, a pancake and in return he let them shoot arrows in his yard and then fed us dinner. Our kitchen was unusable as Lewis was getting it ready for a new dishwasher coming today. Somehow that involved tearing out the counter and sink. When Sebastian first tried the pancakes he said, "We should make these more often." Which means I just have to make them again, as this was the first time we have had them. He doesn't need to worry though, they will appear again. Besides their value as barter they were delicious for breakfast and made a fine snack later. Our poor chickens did not receive any of the leftovers as they all got eaten. Just in case you don't always read all the way through a recipe before proceeding, please notice that the batter needs to rest for 5 to 10 minutes before cooking the pancakes. Before resting the batter will be too thin. 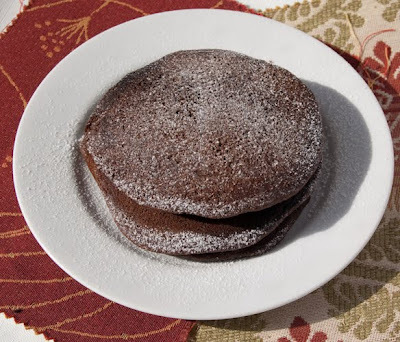 Combine the flour, baking soda, baking powder, ginger, cinnamon, cloves, cocoa powder and salt in a large bowl. In a separate bowl add the sugar to the hot coffee and stir until the sugar dissolves. Add the milk, molasses, butter and eggs to the coffee sugar mixture and stir or whisk to combine. Add the liquid ingredients to the dry ingredients and stir just to blend without over mixing. Let the batter rest for 5 to 10 minutes so it can thicken. Before resting it should be thin and pourable. Heat a skillet or griddle over medium high heat (an electric griddle should be set to 375°) and grease lightly (I used butter and rubbed it around with a paper towel to provide only the thinest surface to the griddle). Ladle 1/4 cup portions of batter on to the hot griddle or skillet leaving space between them. A skillet is hot enough to use when a drop of water dances and evaporates right away on it's surface. The recipe calls for cooking them for 3 to 4 minutes on the first side until the top side is covered with bubbles and the underside is brown. My pancakes needed 6 minutes on the first side. Flip over the pancakes and cook for 2 minutes on the second side, until the second side is browned and set. 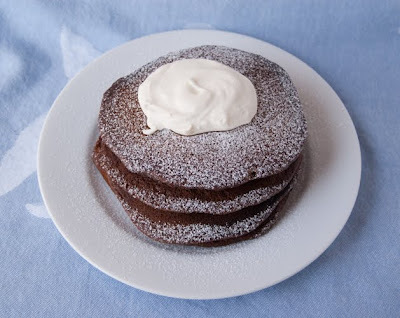 Dust the pancakes with confectioners sugar and serve with a dollop of whipped cream. Leftovers make a fine snack just served plain and eaten out of hand. You might even be able to barter with your neighbors using them as payment.